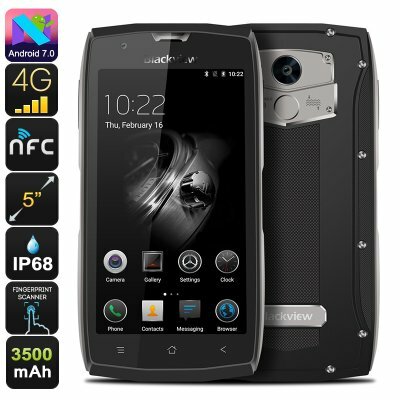 Successfully Added HK Warehouse Blackview BV7000 Rugged Phone - Quad-Core CPU, 2GB RAM, Android 7.0, IP68, Gorilla Glass 3, IP68, 4G, Dual-IMEI to your Shopping Cart. This product is housed in our HK Warehouse. To avoid any delays in processing your order please do not order this item with other products that are not stocked in our HK Warehouse. If you’re looking for a tough Android phone that will follow you wherever you go, the Blackview BV7000 is perfect for you. This rugged smartphone runs on the latest Android 7.0 operating system thanks to which you’ll be able to enjoy a smooth yet powerful experience. It handles the latest Applications and software features available. This allows you to take the most out of your latest Android phone. The phone features a rugged IP68 body that fully products your Android device against water, dust, and drops. It even comes with a Corning Gorilla Glass 3 display that is virtually impossible to scratch or break under normal circumstances. This durable smartphone will treat you with media and keep you connected no matter where you’re at. Your rugged phone features Dual-IMEI numbers. This means that you’ll be able to connect to two network providers simultaneously. Additionally, it comes with 4G support that lets you browse the web wherever you are. Stream movies, download Apps, and make online calls – nothing is too much for this 4G smartphone. You’ll be able to head out to the Play Store and acquire the latest mobile Applications. With this Android phone at your side, you’ll never have to feel bored again. No matter where you’re at, from now on you’ll always be able to stay connected to friends and family back home. Within its IP68 rugged body, this Android smartphone packs a sophisticated Quad-Core CPU. This processor along with the phone’s 2GB RAM brings forth enough power to deal with the latest Applications. The phone furthermore packs 16GB of internal storage and supports a 32GB SD card slot. This provides you with more than enough memory to securely store all files and media. Accessing your files has never been easier thanks to the phone’s ultra-fast fingerprint sensor. With this little feature, you’ll be able to unlock your phone and access your personal pictures and media with the simple touch of a finger. A stunning 5-Inch 1080p display lets you watch movies and series like never before. Its Gorilla Glass display is extremely tough and allows you to even use it in the outdoors without needing to worry about scratches. The phone comes packed with a powerful 3500mAh battery. This cell brings along plenty of juice. With days’ worth of standby time, you’ll be able to head out into the wild with confidence. With this rugged phone, you’ll never again have to fear about running out of juice. The Blackview BV7000 Rugged phone comes with a 12 months warranty, brought to you by the leader in electronic devices as well as wholesale electronic gadgets..